Anyone who enjoys wearing shorts or skirts during the warmer seasons has probably dreamed of a miracle cure for the dimples on their legs. Though cellulite is natural and almost every woman has it regardless of her size or athletic ability (and some men, too! ), it's understandable that it might make you feel a little less comfortable when you're trying to have fun. While there's still no cure-all solution to make your cellulite magically disappear, there are tons of cellulite creams out there that you can slather on before baring your skin in the summer. The best cellulite cream will make you feel like showing off your legs (and other problem areas) as often as you can while the weather is warm enough! Though it may seem too good to be true, you can reduce the appearance of cellulite almost instantly with some of these creams. To help you find the best cellulite cream for you, we searched far and wide and read through tons of reviews to build a list full of great choices. With these ten creams below, you're sure to find the best cellulite cream for you so that your skin is smooth and dimple-free and you can wear all of your cutest outfits with confidence. 1. What Is Cellulite Cream? Cellulite cream is like any other lotion or gel that you put on your body, with the added benefit of reducing the appearance of cellulite on your skin. Cellulite is the result of fat under your skin pushing up against the fibrous tissues of your skin, leading to that bumpy and rippled appearance. 2. What Does Cellulite Cream Do? Cellulite cream firms up your skin temporarily so that it appears tighter and smoother. While cellulite cream doesn't eliminate cellulite itself, it can go a long way towards making your skin look smooth and cellulite-free. 3. How Does Cellulite Cream Work? Often, cellulite cream has ingredients like caffeine, which has been shown to tighten blood vessels and reduce the appearance of the bumps caused by cellulite. Other ingredients are included too, to firm and moisturize your skin at the same time. 4. Where Can You Buy Cellulite Creams? You can purchase cellulite creams at your local drugstore like CVS or Walgreens. You can also purchase them from larger supermarkets like Walmart or Target, or go to a high-end department store such as Bloomingdale's for them. Additionally, you can purchase cellulite creams from beauty product stores like Sephora. If you're trying to buy cellulite cream online, you can order them from a site like Amazon, or directly from the website of your favorite brand. We reviewed all of these quality cellulite creams by searching all over the Internet, reading plenty of editors' picks lists, and going through a ton of customers' reviews so that you could be assured these creams come highly recommended. We compared the features, pros, cons, and price of each so you could make the choice for the best cellulite cream for you. 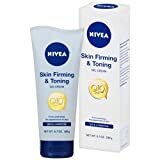 This contouring cream, which is also suitable for vegans, packs some powerful botanical ingredients to work at keeping your skin as smooth as possible. 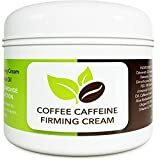 Caffeine helps tighten while sodium hyaluronate and shea butter really moisturize your skin, and vitamin B5, soybean oil, and shitake mushroom extract all help your skin become supple. Over time, this cream shows results so you can feel good showing off. This luxurious scrub is meant to be used in the shower. You scrub your body with it under hot water to increase effectiveness and then finish up with a cold blast of water to seal in the ingredients. This powerful combination contains caffeine, marine algae, and ginger essential oil to tighten your skin. As a bonus, it contains tiny spheres in the scrub to exfoliate while it works for immediate results. This firming cream is designed to be a two-in-one product that helps you fight aging while also fighting those stubborn dimples. This cream uses four different oils along with caffeine and vitamins A and E to make sure your skin remains super-hydrated and smooth. Considering that sagging skin goes hand-in-hand with aging, what's not to love about a cream that tackles that and cellulite too? This cream can even be used on your face to get rid of any issues with dark eyes or puffiness. This gel-cream is perfect for toning up your body in as little as two weeks. It combines coenzyme Q10 with L-carnitine and lotus extract to make skin look almost instantly tighter. With such an affordable price, it's worth a shot even if the results end up less than desired. This concentrate works to moisturize the skin, to plump tissues and support the skin surface again so it looks smooth rather than bumpy. Though pricey, after a few weeks of use, this concentrate helps fix the underlying causes of the appearance of cellulite. Over time, this formula will hydrate your skin, restored to its former, even state. 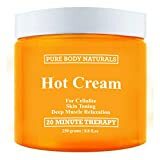 This hot cream-gel is a multi-use product intended for deep-body massages as well as to help tone and tighten skin. The peppermint and pine oils provide a calm, relaxing spa experience for deep massaging, and the cooling and heating sensations relieve muscle pain. After usage, blood circulation improves, helping counter the appearance of cellulite. This scrub is perfect for using in the shower and pretending you're taking a luxurious vacation somewhere. 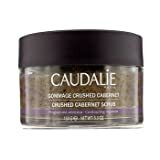 Inspired by grapes and wine, this scrub has crushed grape seeds and brown sugar to help exfoliate your skin while you scrub it. Then, to make sure your skin is as soft as a baby's, six essential oils work to moisturize. This scrub helps drain your skin, and it makes your skin noticeably softer after even one use. This cream works to combat a bunch of unwanted skin conditions such as cellulite, scars, stretch marks, dry skin, and fine lines. Three essential oils help to moisturize and eliminate dryness while other botanical ingredients stimulate blood circulation to fight cellulite. With all of its uses, this cream helps soften skin and get rid of any skin problems you may be having. This cream seems fit for royalty with 24kt gold included to fight inflammation and protect skin against free radicals. This cream uses argan oil to help make skin baby-soft, while aloe and lotus extract help to fight redness and even out complexion. Coffee bean tightens everything up so you can comfortably wear any outfit you want. The Soap And Glory folks put the instructions for this serum right up front in its name - Sit Tight is designed to release its ingredients slowly so that even if you're watching your favorite shows on Netflix, it's working to tighten your skin while you sit on the couch! Using sweet almond oil, sweet orange oil, olive oil, and an incredible blend of other essential oils, this serum produces a tingling feeling to let you know it's working. 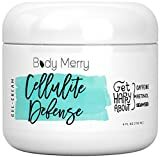 Out of all of these quality cellulite creams, it was difficult to pick a favorite, but we've determined that the best cellulite cream for most people is the Body Merry Cellulite Defense Cream. It's only suitable for those who don't mind menthol, so if menthol's cool with you, this cream could relieve a lot of your most stubborn skin problems. From fine lines to the cellulite you're struggling to get rid of, this cream can take care of it all. Because it's so effective and multi-purpose too, we had to rank it the best cellulite cream that money can buy. For those who don't mind spending a little more money on their best cellulite cream, we've decided the SkinCeuticals Body Tightening Concentrate is the best cellulite cream. Though it's definitely not cheap, the formula helps restore skin to its former bouncy and smooth state. With tripeptides that plump skin and a combination of ingredients to promote collagen production, this is the best cellulite cream for anyone who can afford to splurge on it. Now that you know a little more about cellulite creams and the different ingredients and benefits they have, hopefully, you can find the best cellulite cream for you. Some have the added benefits of helping with skin concerns other than cellulite, but no matter which one from this list you choose, you're sure to find the best cellulite cream to have you feeling confident and free in the warmer weather.